BIO-CLEAN is a blend of bacteria and enzymes. The bacteria are natural, not genetically- engineered. The enzyme concentration is the most powerful on the market. 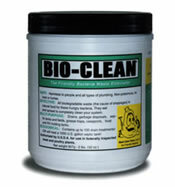 BIO-CLEAN can be used in an outhouse or any type of raw sewage pit or cesspool. It is an effective treatment for cleaning up human waste. Bio-Clean is non- poisonous. It creates no heat, no fumes, no boiling. It does not attack live tissue nor inorganic materials, only organic wastes such as: Human waste, grease, hair, food particles, paper, cotton & sewage. This makes BIO-CLEAN safe for people, plumbing and the environment. BIO- CLEAN changes the waste particles into water, carbon dioxide and mineral ash which become harmless in the outhouse, cesspool, pit, or waste system. These elements are then available to use as compost in the garden. BIO-CLEAN is EFFECTIVE. Within an hour after pouring the bacteria powder into the drain or outhouse, the bacteria begin to eat their way into the waste that has accumulated. This is their natural food. They digest the waste, cleaning it up completely. You can dump the powder onto any sewage spill and it will clean it up. BIO-CLEAN works on Porta-Potties, Outhouses, Cesspools, Septic tanks and drain fields, Kitchen sinks, Lavatories, Bath tubs, Showers, Floor drains, Laundry drains, Garbage disposal odors, Grease traps, Sewage ejector sumps, R.V. & boat holding tanks, Lift Stations, Cat Litter Boxes.
? A small amount will treat an outhouse or sewage pit in the back yard and turns it to compost.